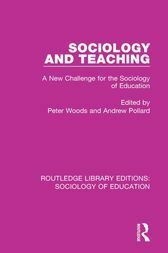 First published in 1988, this work considers the ways in which the sociology of education can inform educational practice. It examines the research which marries the two fields and considers the thinking behind it. It addresses key themes such as: sociological awareness or imagination, and how it might be stimulated and enriched by educational study; reflectivity for both teachers and sociologists; and ethnography, the major research orientation behind most of these studies.